When it comes to kitchen accessories I’ve learnt the hard way to invest in top quality items, rather than cheap throwaways. A good example was my long overdue Le Creuset cast iron pot, the successor to several mediocre casserole pots. The price was eye watering at the time but years later I’m happy – you could say that the return on my investment has been good. I remembered this lesson a few weeks ago when searching for a loaf pan. The easy and cheap option would’ve been to pick up a cheap silicon one from my local supermarket. But instead I decided on an Emile Henry loaf pan that I’ll cherish for years to come. Within days of my new loaf pan arriving Liz from Spades, Spatulas and Spoons shared her new Emile Henry clay pot tagine – as part of her monthly In My Kitchen series. Liz explained how Emile Henry’s ceramic bakeware has been made in France since 1850 from Burgundy clay that’s unsurpassed for conducting and retaining heat. She also pointed out that their products come with a 10 year guarantee. Her purchase was clearly even more well researched than my own. Anyway on to this recipe, my 200th Feast Wisely post, to showcase my lovely new loaf pan. Sweet potatoes – are full of beta-carotene which has anti-viral, anti-oxidant and anti-cancer properties. Himalayan salt – said to be the purest salt it contains 80+ trace minerals that are found in the human body. 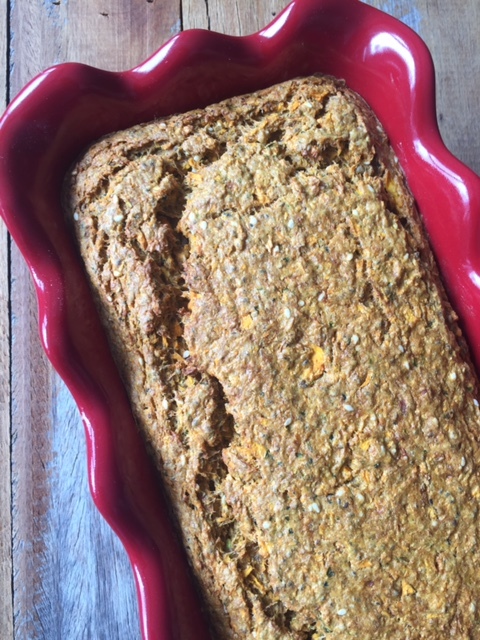 Dearna’s paleo and gluten free recipe can be easily adapted to make it your own – for example I made the following changes, the first of which stripped my bread of ‘GF’ status…. Overall I was really pleased with the outcome – it tasted delicious sliced and re-toasted and then smothered with ricotta. Check out the recipe here and see what you think! 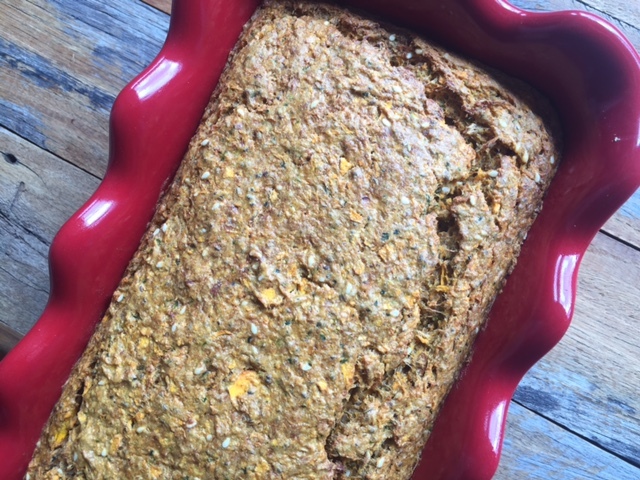 Tags: bread, paleo, recipe, sweet potato. Bookmark the permalink. Delicious, Laura and I like the changes you made. The chia seeds and apple cider vinegar in particular sound like a great addition. Thanks Liz – you should treat yourself to a Le Creuset one day….nice to you are back too. Thanks again Dearna for your inspiration! 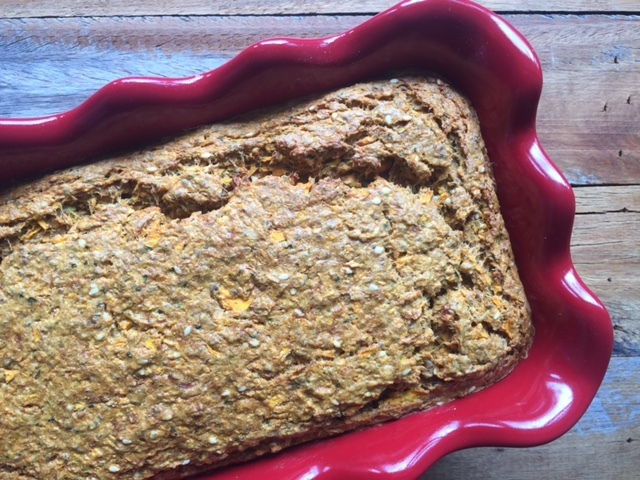 What a great recipe using psyllium husk in the yummy sweet potato bread! I also liked your idea of using chia seed egg. Congratulations on your 200th post! Thanks Sandhya and glad you like the loaf pan – you reminded me I need to use it again very soon!